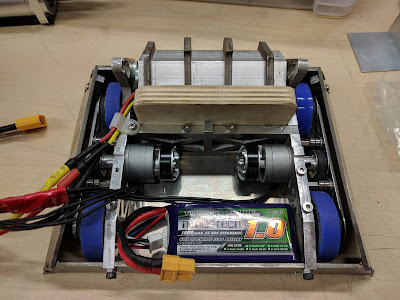 Previously I used the standard 25mm gearbox and 1806 brushless gearmotor combination to drive Bourbon around. However one of the biggest problems with these gearboxes is that the gears jam and/or strip which makes using them for combat robotics a difficult prospect. 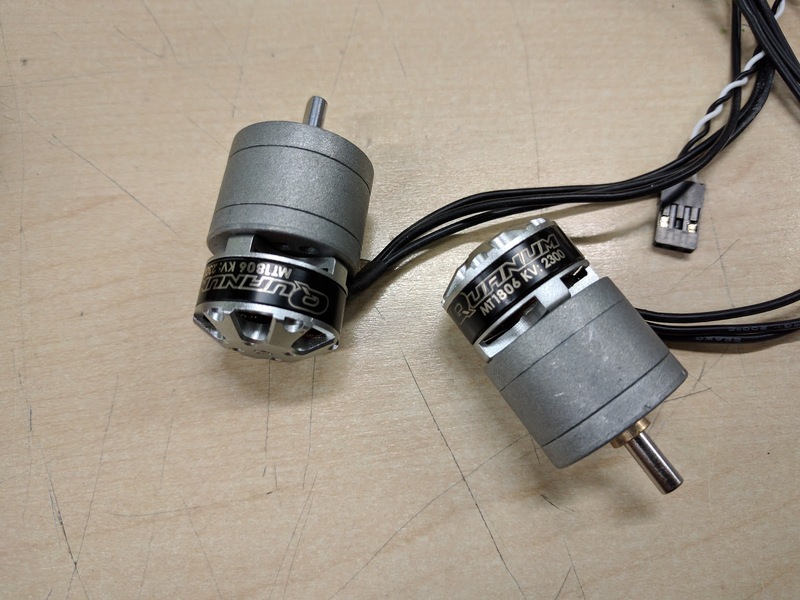 The main positive is that they're much lighter and more powerful than the original 25mm gearmotors. In addition because the 1806 brushless motors are so much lighter than the original DC motor they're less likely to pull apart between the gearbox and motor. 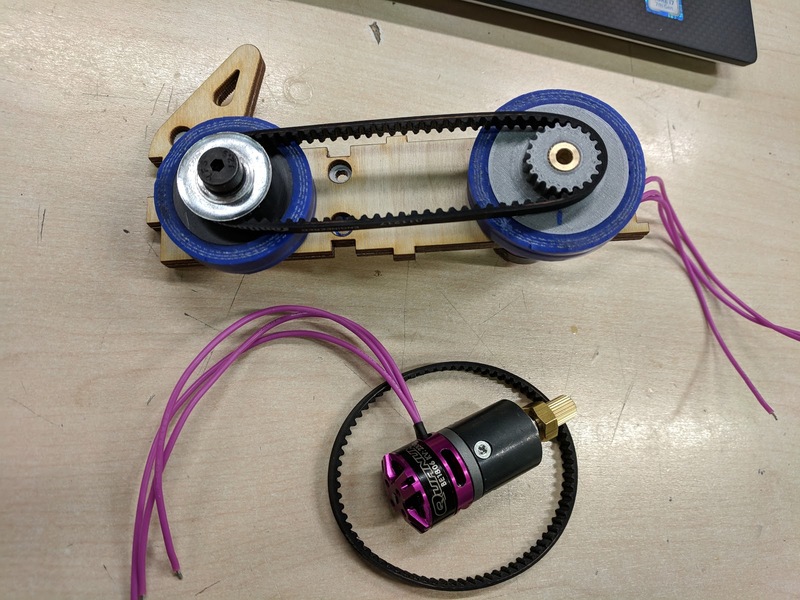 Once I found a seller on AliExpress selling the raw gearboxes without the DC motor it was an easy switch for me. In fact Bourbon is designed around these motors. The much longer length DC motors would not fit inside Bourbon's chassis. 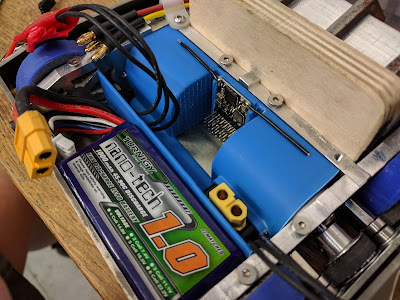 It did originally present some difficulty by having the rotating brushless motor can abrading wires but once I 3D printed a special electronics shield/caddy it all went together very nicely. However now I am starting work on the next version of Bourbon and I wanted to increase the drive power whilst increasing the drive reliability. The best way to do this I felt was to ditch the 25mm spur gearboxes for something better, capable of handling more power. Weirdly while looking for more robust gearboxes I came across these planetary gearboxes which are actually smaller than my original 25mm gearboxes. And yet despite the diameter reduction they are full metal planetary gearboxes which means they are a lot more robust than the original spur gearboxes. The spur gearboxes would bind and lock up if the 2 internal axles were to go slightly out of perpendicularity. Also as spur gearboxes each gear only had ~1mm of tooth width to engage with the next gear which made it easy for teeth to strip. These new planetary gearboxes have 3 gears at each stage which leads to almost 3mm of tooth width engaged. However the eBay listing for these new gearboxes does not list an exact ratio so I set about calculating it. The Pinion gear has an Outer Diameter (OD) of 7.09mm and a tooth root diameter of 5.38mm. 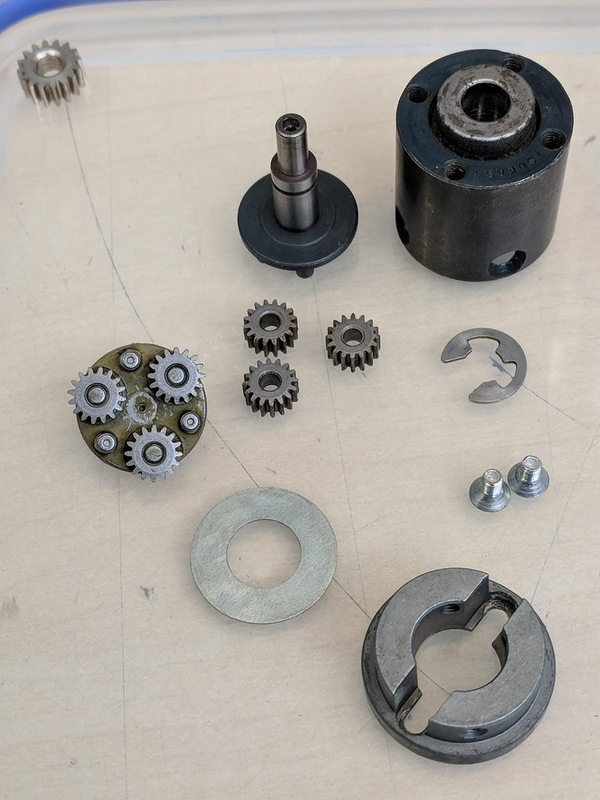 It has 16 teeth and so to calculate the pinion tooth Module: 7.09mm / (12 teeth + 2) which results in a tooth module of 0.50642MOD. That is probably not quite a real tooth module so I've rounded it up to 0.5MOD. 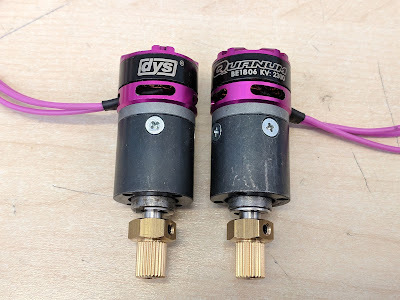 I also took the opportunity to upgrade the motors from the QUANUM MT1806 to the QUANUM BE1806 Race Edition. This boosted the drive power from 85 Watts to 230 Watts (if HobbyKing ratings can be believed...). Another advange of these new motors is the motor shaft has been increased in diameter to 3mm from 2mm. This makes it easier to mount the new pinion as well as improving the robustness of the motor. In addition it seems like the MT1806 is now discontinued and unavailable. One downside to these new gearboxes is that they're longer and heavier than the original 25mm gearboxes and they also have a completely different mounting pattern. I also wanted to fix Bourbon's main design weakness. The center of gravity is right behind the drum, this is great whilst Bourbon has all 4 wheels on the ground, but when flipped over there is very little weight on the rear wheels. These rear wheels were designed to protrude above the top/rear armour and would allow me to still drive in the event that Bourbon was flipped over. However in reality as the center of gravity is so far forwards they cannot gain any sort of traction and just spin not moving Bourbon around the arena. To fix this problem I'm planning on moving the drive motors from behind the drum to the rear of the robot. This means that I need to completely rethink the belt path from the original Bourbon. Other parts of Bourbon will be remaining the same: the drum is working excellently and the armour is resisting opponents successfully. Thanks to my access to the Makespace laser cutters I was able to knock up a quick and simple little test side rail to see how the belt would go together. 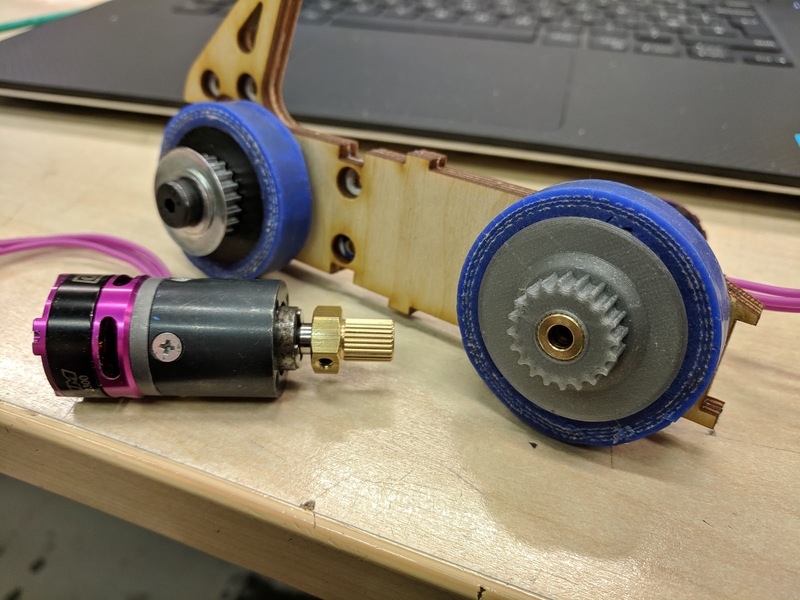 In the above picture I'm using one my original wheels as well as a new custom 3D printed wheel to get a feel for the belt tensioning. I'm still working on this but hope to have everything ready before Christmas.